AuntieNan left a comment on my Godey's post that I started to answer, but realized it was going to be long enough (and could do with illustrations) that it'd be better served as a full post. I had a costume history teacher who talked about the development of feminism and how a burst of power for women was usually followed by a period of excessively feminine line for women--the long Victorian period that came after Mary Wollstonecraft, the 1950s after the flappers and freedom during the big wars. She also said that in times of feminist freedom, fashion played down the more assertive lines of a woman's figure--that a woman could only take the reins if she looked as much like an androgynous creature as possible. I don't know if that's true, or accepted thinking, but she sure had some good examples to back her up!! I remember coming across this in The Beauty Myth, and at the time it seemed to make a lot of sense to me, but I've since done a lot of studying (staring at fashion plates) (and Pinterest, can't forget that, I have over 5k pins right now) and learned more specifics, and fashion now seems too complicated to sum up in that way. The trouble with trying to pinpoint reasons for changes in dress is that they're so rarely abrupt. In my fashion mythbusters symposium/class, we watched several episodes of a cable tv show that was meant to show the history of the little black dress, makeup, high heels, etc. but failed, mainly as a result of its constant use of single events/films/people to drive history. 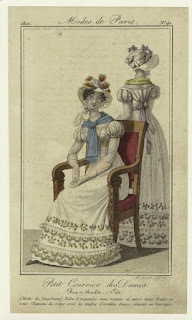 If you look at fashion plates in order from 1800 to 1840, it makes sense for dress to go the way it did - for the waist to drop and tighten, for the skirts to bell out - because all the changes are so gradual. Fashion is always looking for something new (while also always looking back to the past), so the high waist had to boomerang back to a low waist, puffed sleeves had to flatten out to fitted ones, narrow skirts had to flare out and then get fuller. Going directly from the top row to the bottom one shows a huge jump, but it's little steps all along the way - and slow enough that it's difficult for me to believe that it was a reaction to any single thing. At the same time, the 1790s/1800s are hard to characterize in terms of modern feminism. 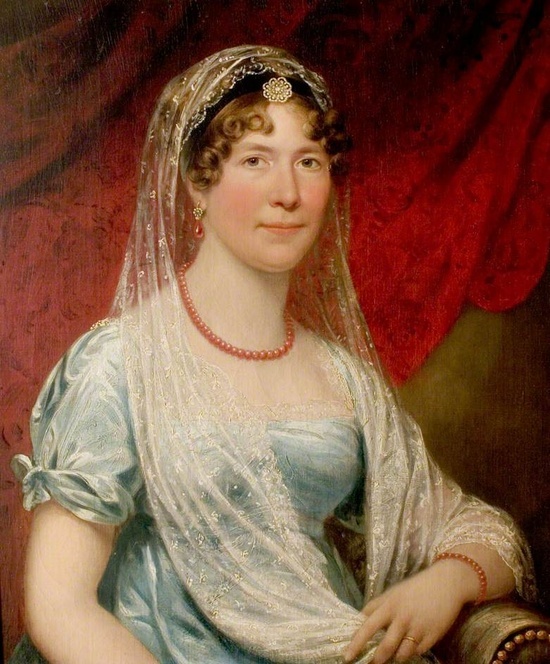 There were literary, educated women through the eighteenth century who advocated for women's education, but they didn't have a huge impact on society. Rousseau's theories on child-rearing, innocence, nature, etc. 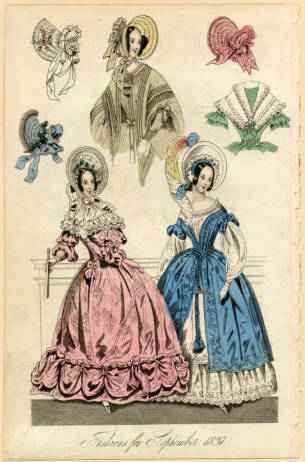 were more widely influential, and are considered today as modern and appropriate, yet they paved the way for the cult of motherhood of the nineteenth century that's seen as going hand-in-hand with the "dowdy", "repressed" fashions of the late 1830s and the 1840s. Throughout the Victorian era, there were feminists continuing to champion women's rights and sometimes win battles (both the US and the UK had various Married Women's Rights Acts that gave women a chance for custody, ownership of money and property, etc. 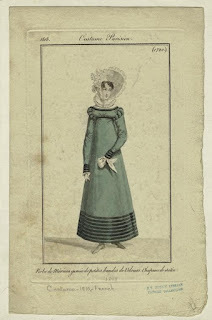 and divorce became more common and simpler), but it's hard to show that women's fashions grew more feminine in response. 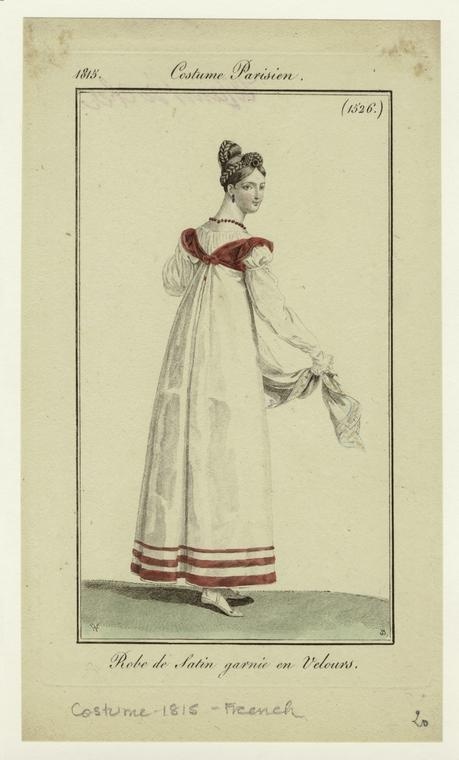 In fact, the influence of menswear in women's dress increased, with suit and cravat effects and "tailormades". 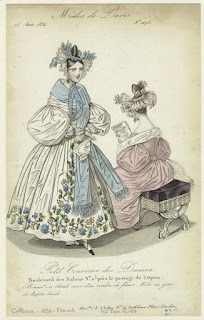 But in the first place, when comparing Regency fashions to those of the early Victorians, how can one decide which is more restrictive or feminine? 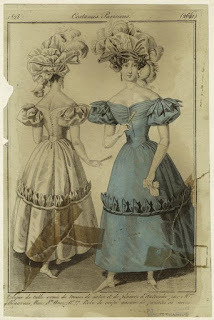 1800s/1810s fashion wasn't androgynous - although the hourglass figure wasn't popular then, the bust was prominently raised and the body's shape was comparatively apparent through light gowns, making the "long stay" a necessity for women who weren't slender. It's really hard to define "periods of feminist freedom". The 1920s are thought of as such because we value the moral liberation side of feminism the most when we talk about history (that's my impression, anyway) and women were definitely liberated in terms of behavior in comparison to earlier decades, and in America and the UK the right to vote had just been won - but in other aspects, there's not much difference from before. There was still unequal pay, women were still only employed in a few specific and limited positions, marriage was still often a bar to work outside the home, all that sort of thing. At the same time, I question the popularly-thought-of androgyny of the 1920s. 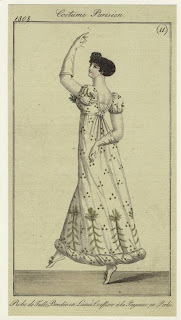 While fashion plates do show short-haired, thin women (which go from ordinary-thin in the early '20s to caricature-thin in the middle of the decade, and then get broader in the shoulder towards the end), high-heeled shoes, skirts of varying lengths, embroidery and beading, floral patterns, lace, and pastel colors all contribute to a highly feminine look. The faces on these fashion plate ladies are also very cute and girlish, with well-defined bow lips. And then - sorry, my last point - there are the designers and fashion icons that affected fashions the most. Their individual motivations were perhaps the most relevant to what styles were successful; in the case of the latter, looking splendid and beautiful was the goal. For both, constant change to remain ahead of the following masses was hugely important, as well as personal taste. Many male couturiers are known to have designed clothing that would suit their wives (such as Paul Poiret, who helped to create the slender 1910s and '20s line). To conclude, I'd have to say that I do think there's social pushback when women advance and push the envelope, but I don't think it was/is imposed through clothing. 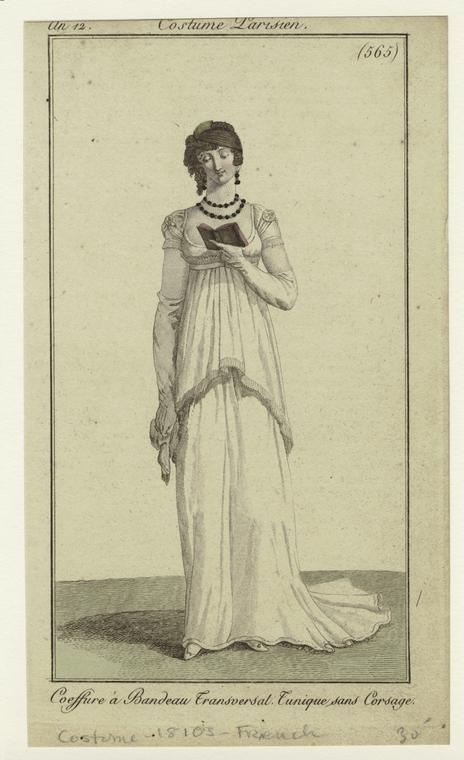 There are too many factors influencing fashion - popular fiction (see Dolly Varden), designers' tastes, nostalgia, art history, theatrical roles, archaeological discoveries - and far too many women in too many different situations and countries that would have to collude in reacting that way. 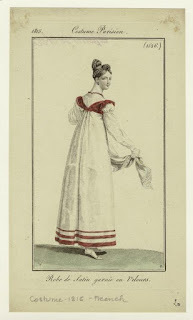 One of the constant debates in fashion history is what effect non-couturier men have in women's dress - many have stated that women wore corsets and various skirt supports to attract men, or other "because of men" reasons, but it's becoming more popular to see clothing as a tool used by women for other means. The New Look was incredibly popular with women who wanted that luxurious, hyper-feminine style after the fabric rationing of the war. Dior (and the other designers doing the same thing at that time) were only picking up where fashion had been heading before WWII - toward a more hourglass figure and fuller skirts. Women's fashion is first and foremost something that women put on themselves, and while patriarchal pressure can affect what women feel is acceptable to wear, there is also a large element of choice. Some women feel empowered when taking on masculine aspects in dress, and others feel empowered when emphasizing an hourglass figure, probably depending on what flatters the individual. I know that corsetless and in a tubular ca. 1926 evening dress I would be horribly self-conscious and uncomfortable! I want to stand up and cheer! One of the biggest things to push my buttons is someone with an agenda bolstering it by cherry-picking examples from history, without even context, much less real research. What happened to just looking at the facts and THEN theorizing? A particular one that's been bothering me is that WWII is cited as women's first chance to work out of the home. That's a hugely problematic statement anyway, because it ignores how the economy and nature of business/jobs have evolved since the 18th century. But did you know that there were female clerks working the U.S. Treasury Department in 1865? There's a picture of them leaving work during a rainstorm, printed in Harper's Weekly. It's valuable for showing what real women wore in the rain, but it's also notable just for what they were. And HW didn't treat the subject as if it was unusual, either. Whew - that's not the sort of comment I meant to leave! I just really wanted to say that I agree with everything you said. You presented lots of facts and showed how silly it is to put such a broad interpretation on something as complex as fashion. Yes, I think what I meant to have at the end (a lot of rearranging and deleting went on) was that fashion being cyclical, frothy - plain - frothy - plain is bound to result in at least one correspondence with a second trend. You know, I just - like within the last couple of days - came across an article on mid-century female government clerks ... I think it's in my 1875 Godey's? I've seen so many "women were finally allowed to work outside the home" dates - just like "the arrival/creation of the middle class" or "people were now able to buy titles". The 1920s comes up a lot as "women were finally able to live on their own", but I read a book from 1911 recently that mentioned female clerks living in horrible little cheap apartments. For a while I found on Project Gutenberg several novels written in the 1900s-1910s, involving New York women working in offices. It was a novel without any ax to grind that I remember. The apartments were very cheap; there were also boarding houses/dorms for working girls. What stood out, though, is that there was nothing throughout the novel(s) that implied it was unusual for these women to be working, or that other people looked down on them or disapproved of them for it. There were class differences, of course, but that was it. Class seems to be the main issue people are thinking of when it comes to work - sometimes it's like people only look at the upper tiers and then generalize to the rest. Women worked as a matter of course, but because it was a matter of necessity rather than choice/vocation it somehow doesn't count. 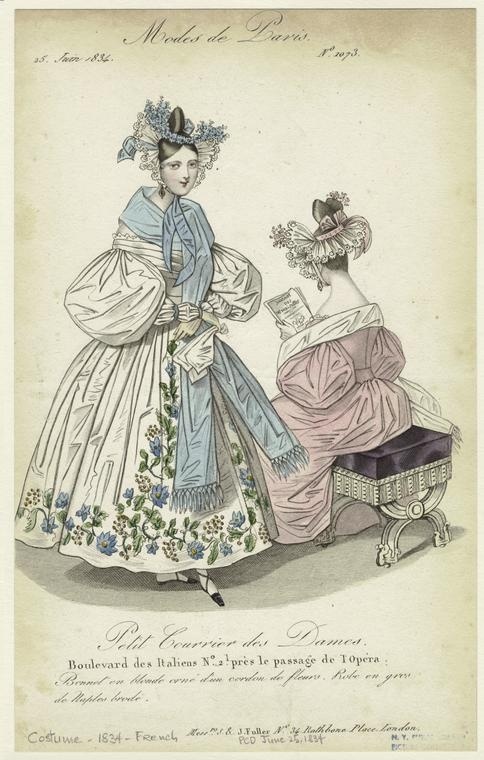 Have you read Cunnington's "Fashion & Women's Attitudes"? Pretty dated, but interesting take on a similar topic. What about the practical changes in dress that affected women's literal freedom, as in letting them move better, dress themselves without help, spend less time primping, etc.? For example, the cage crinoline (while ridiculous in retrospect it was actually MUCH easier to wear than piles of petticoats)? And the ideas about health that spurred the evolution of the corset? The front opening busk? Aesthetic dress movement? 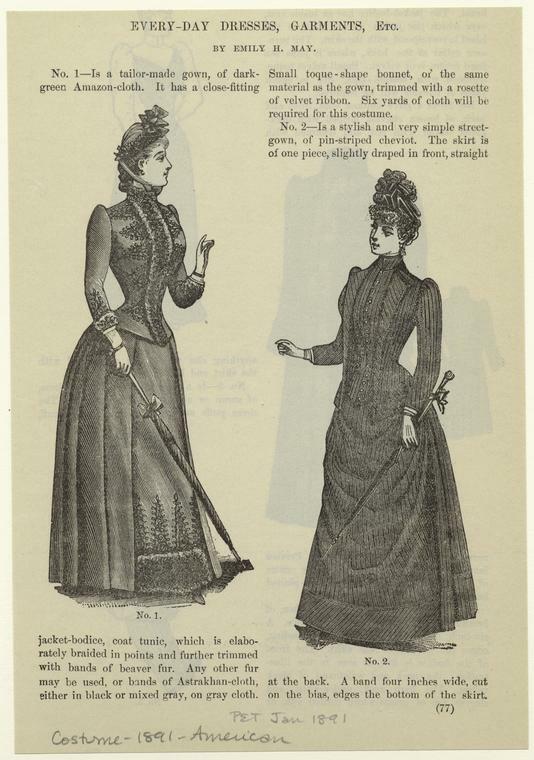 The gradual elimination of trains and rise of hemlines starting in the Edwardian era? Bobbed hair? I wonder how many of these relatively sensible changes were driven by women...and what effect they had on "Fashion?" or vice versa. I actually bought that one to make up an Amazon order and get free shipping! Mainly for the photos, but I found it a pretty good read. Great post! 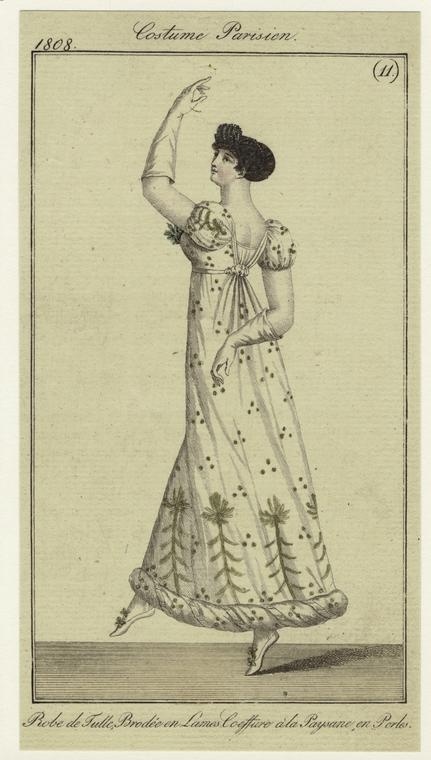 I feel like the same discussion of gradual changes in fashion can apply elsewhere, too--such as the "simplicity" of the Regency/Federal period always being attributed to the French Revolution, but the movement toward pared-down silhouettes and toned-down trim are evident well before that. The relationship between clothing/fashion and the political/cultural climate is much more complicated than a quick cause and effect! Exactly! I think it's part of a natural progression - you know nothing about historical fashion, you know enough to date a period movie in general, you start learning a bit more and can make a generalization about every decade between 1750 and the present, soon you get cocky and draw conclusions ... then you hit the "realizing how much you don't know" wall and it's all screwy from there. "I need to improve my knowledge of the 1850s" is not a thing many people think. There is this great BBC short documentary series from the 50s that is available on youtube (you probably know it), Men women and clothes, they have this one episode about changes in fashion (how fashions come and go) and the presenter goes into it, how fashion not only changes slowly, but also in congruence with the rest of the taste (bell shaped domes on houses and greenhouses in the 1840s, long columns in the 1810s etc). The series does a great job of placing fashion in a context, debunk some myths and is very informative too. And to top it all off, they show only actual historical clothing (worn by actual people) not reproductions. Impeccably expressed. This was a delight to read and gave me more than a few reasons to reconsider my (admittedly ignorant) grasp of several historic shifts in fashion. That said, I get incredibly annoyed at the "and then --- wore a --- to the ---, changing the course of women's fashion forever" statements that seem to roll down the pike so easily in some venues. I'm beginning to wonder how much of that mentality is a modern phenomenon. I own several antique fashion and costume books, and it is extremely rare for any one style to be attributed to the influence of an individual. Yet, modern discussions of fashion inevitably default to such finger pointing (Women didn't have tans until Coco Chanel came back from the French Riviera! 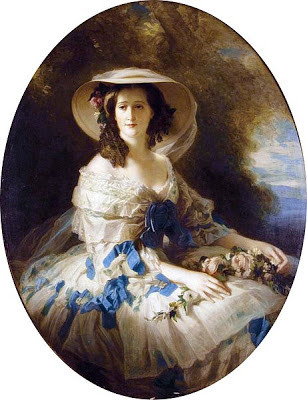 Empress Eugenie's pregnancy is the only reason hoopskirts came into fashion!). Perhaps it's the very modern, very Western obsession with the self? Anyway, that's my mad ramble for the night. Thanks for the awesome post! Thanks for this post -- I can see you inspire a lot of comments! I think that a lot of the time when a movie (or something like military details during a war) has an effect on fashion, though, it's because there's something already there that has the potential to be developed. Maybe part of why the movies become popular is that they're responding to that. Sort of a constructive interference thing. I hope you don't feel like I was attacking you by criticizing what you brought up in your comment so lengthily! It just all came out. Well written, and I very much agree! I think one thing to always keep in mind is that most people aren't willing to dress is a way that is completely radically different from how they were raised or what society around them is doing. And, that while people can and do change their lives to suit fashion, they also change their clothes to suit their lives. 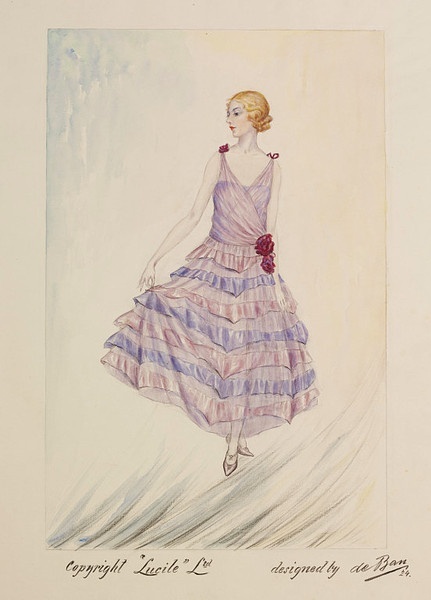 On the subject of 1920s fashion, one observation that has always struck me is Valerie Steele's, that 1920s women's styles weren't so much about looking masculine but looking like children. You can see 1920s styles worn by young girls in the 1910s... Just like the chemise gown and regency styles were worn by children in the late 18th c.
Oh yes! I definitely think about that when I look at the images of children's clothing in the 1910s McCall's Magazines. You can certainly see where some of the inspiration is coming from. THANK YOU. I've studied the history of clothing for lo these 25 years, and I get so tired of things being taken out of context or "cherry picked", as a previous commenter said. 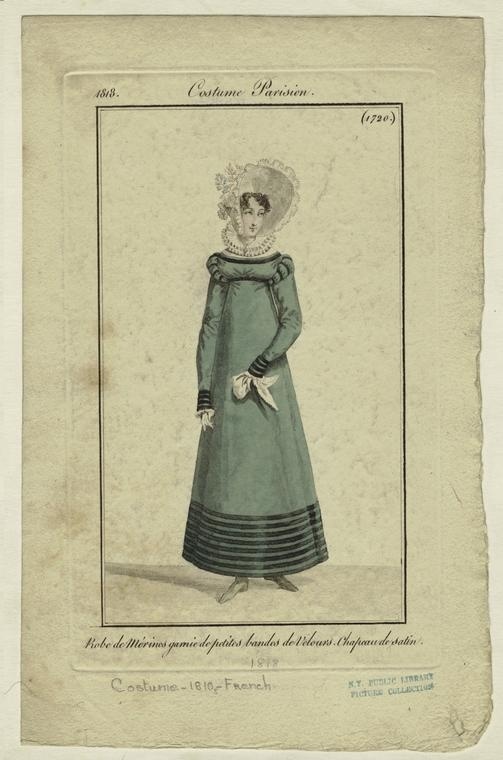 This is why costume history is so interesting to me--there's so much to take in and consolidate and reword. It makes me readjust my previous opinions. I love it. You're welcome! There are definitely a lot of stereotypes and broad generalizations out there on this subject.